This is the 1st day of my ’30 Day challenge using a mobile devices in business’. This challenge was set by someone I had just met yesterday. George Samuels from www.siosism.com helped me with a ‘vision audit’ for my business and helped clarify and clear the confusion that I had regarding the plan for 2014. He suggested about writing for 30 days on a topic and then putting it into an eBook and sharing the content on my website, so here is Day 1! I am passionate about showing people that they can run their business from their mobile device, so here goes (typing this in Google Drive). Checked Twitter on my iPad with Retina (purchased last year) and responded to some messages from @WeTeachMe where I ran my first Evernote session (in conjunction with Evernote Australia© last night at the York Butter Factory situated in Melbourne, CBD. 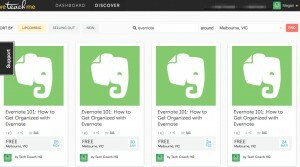 Evernote has recognised that I am an expert in the area of productivity for small business and business and being an innovator and speaker on this topic. A great venue and a huge thanks to Kym Huynh to getting it started. 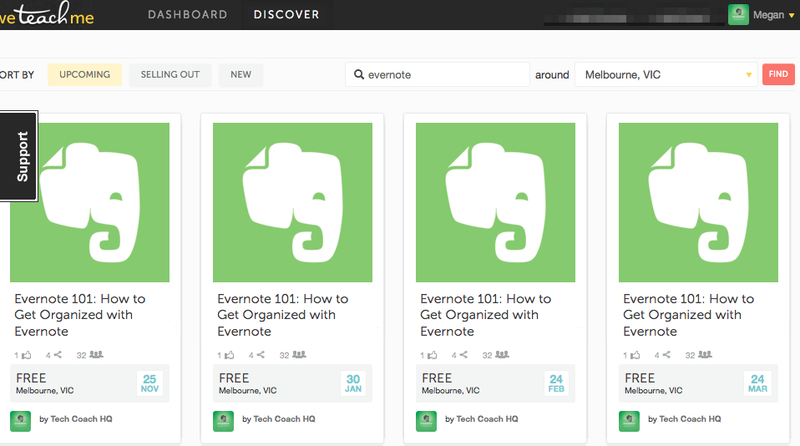 I then re-tweeted some links out and added further information to the #Evernote hashtag. When I get up early in the morning, I try and do my social media first up so I don’t get distracted for the day. 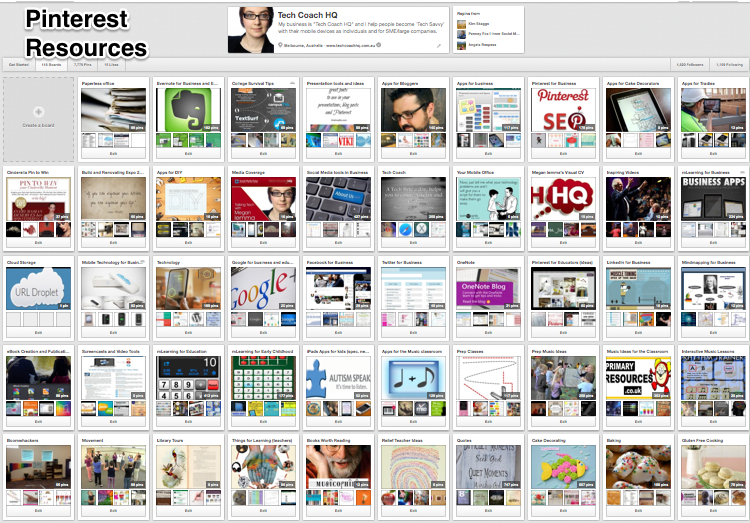 I usually quickly check what has been pinned to my Pinterest board and then add fresh content and re-pin ideas. 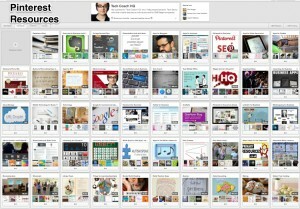 Pinterest is really powerful on iOS with this shortcut from ‘Geek Mummy’ Blog. It teaches you in a 6 step process how to add a bookmark to your iOS device so that you can ‘Pin’ from any website that has a video or image. Actually, it is much more addictive this way than using the Pinterest desktop app and helps curate fresh content, rather than just what everyone else has pinned. I like to call this ‘baking” not just ‘eating’ content. I had to work on a brief for a client this morning that included working on a Microsoft Office Document, so I opened up CloudOn for iOS and picked up the file from my DropBox. I love that this free and it’s like using Microsoft Office (can edit Word, Excel and PowerPoint). I use my Dropbox and Google Drive as I have different uses for both these cloud services. Part of this brief was to work on a presentation for the client. I always brainstorm my content first and my first choice of apps for iOS is ‘Inspiration for iPad’. So, brainstormed this idea out (see below) and then I can send the mindmap via email and use the text to flesh out the idea for my presentations. I recently did a presentation entitled ‘Presenting from the Palm of your Hand’ (also wrote 4 blog posts about this for ‘CBA ‘Women in Focus’ website. and it demonstrated to people all the different ways of utilising your mobile device to create, plan and present via a mobile device whether it is a smartphone or tablet. So, my next step is to create a Keynote using the app ‘Keynote’ and import screenshots from ‘Skitch’ which are saved to my camera roll. A Skype call has just come thru while typing this document so I have answered it on my iPad meaning I am not required to be tethered to my laptop (even though I do love my Macbook Pro). When managing any business, the key to success is to have great systems in place so that you can spend more time doing the things you like (hint: reading eBooks). I love Evernote for my knowledge management system and my ‘digital filing cabinet’. 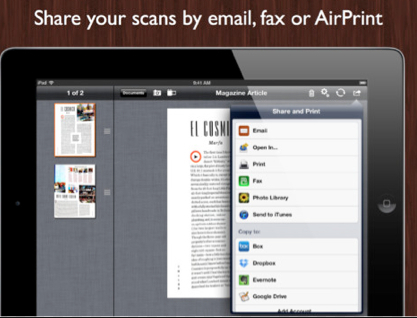 After the Skype, I needed to photocopy some documents for a client, and I used ‘JotNot Scanner Pro’. I love this app because I can take shot using the iPad’s camera and then crop the photo and then process it so it looks exactly like a photocopy and then of course share the information wherever I need to process it like > Evernote App or to Dropbox. Enough work for today, Spring has finally come and time to enjoy the sunshine. Until tomorrow, good night and remember to take things ‘one byte at a time’. From the ‘Tech Coach HQ’. Hi Megan, Good idea and I’m really interested to see how this works out. IU’m not sure I could survive with just an iPad as my only device, but it’s an interesting challenge. I do know that my son has been travelling the world for the past 5 months and has only had an iPad to use. He has done all his blogging, travel bookings, email, facebook, photography, etc on it as his only device. Seems to have been working out ok. Blog at http://www.alexbetcher.com if you’re interested. LOVE this mobile challenge you made for yourself and the awesome content you have presented in blog form for us to read. Sharing this on twitter and THANK you heaps for all your work, dedication and sensational content.